I hope you all had a fabulous time during the holidays with your friends and family. I can say that I really enjoyed the time with the family and friends...but have missed all my fellow bloggers and readers so it is so nice to be back :) Over the last few months I've been experimenting with masks. I have to be honest and say that I have been very inconsistent about using a face masks. When I had acne issues, I was a little more reliant on them, mainly the proactive mask (Which I'm sure you are all familiar with). But it was time to branch out, so on a random trip to Ulta, I decided to try out two of Mario Badescus masks. The Enzyme Revitilizing Mask﻿ - This product has seriously become my new HG. It softens and brightens my skin like no other. I'm the type that tends to prefer softer,gentler masks and this one is perfect for that. I leave it on for 20 minutes or so, and as soon as I wipe it off, I notice an immediete change and they results are even better the next day. I am trying to maintain this at least once a week (although it states you can use it up to 2-3 per week if you wanted to). 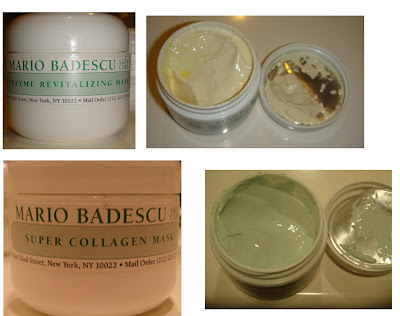 I've used it now for about 2 months, and I've noticed and have ben told that my skin looks a lot fresher and softer. Another thing I really like about this mask in particular is that its a softer exfoliant (no sugar, so salt, etc.). It also has a really pleasant citrus smell, so its not overwhelmig or unappealing at all. The Super Collagen Mask - I probably should of stayed with my initial instict not to purchase this mask. There is nothing wrong with it, but I think that it would be much better suited for skin that was a bit more mature than mine (I'm thinking this will be in my Mom's cabinet soon). The mask is a typical dry once applied type of consistency. It's a bit thicker than I would like (think queen mint julep) but with a much ligther smell (def a plus). I just think it would be more beneficial for firming and restoring collagen and elasticity to older skin and is not really the product for me at the moment. I do like the consistency, and would reccomend it to others. Not bad, not good, just indifferent about it.